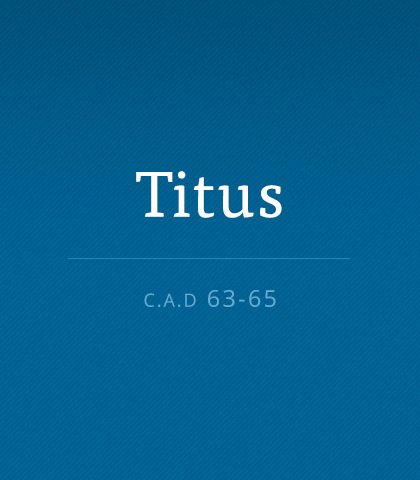 Three summaries of the incarnation dot the pages of Titus, providing a framework for the Christian to view the work of God in the world. Read more about the book of Titus. He is coming back. What a difference it will make! He is coming back. What a difference it will make!" It is remarkable, when you stop and get specific about it, how many things we take for granted will suddenly be removed or changed drastically. Think about that. Do your words and actions meet up? Your kids may not hear what you’re saying but they definitely notice what you do. Kids benefit from authenticity. If you’re not consistent, they will turn you off. Those who God saves by His grace need to look out for those who haven’t yet come to the Saviour. Don’t make it hard for others by insulting those who aren’t living the life you would like them to live. God’s work is sacred. So when a person engaged in ministry repeatedly defies God’s high and holy standards, that individual is to be removed. We all need love and friendship, especially when times are tough. Friends take the sting and loneliness out of life. Here are two statements from Chuck Swindoll on how to live this Christian life. Number one, it takes authenticity and integrity to win a hearing. Number two, it’s impossible to convince anyone of any truth you’re not living. Be real, have fun, and be honest. When you live with authenticity and integrity your truthfulness is disarming.